We are pleased to announce that all DailyEndorphin challenge participants who wear any Fitbit device can now sync up real-time with your DE user accounts while registered in step challenge. This key new feature, at no additional cost to our current pricing, combines the power and administrative control of DailyEndorphin team or individual-based wellness challenge with the convenience of verifiable data through Fitbit. Now you can encourage colleagues, friends, and family to easily sync up your device’s steps data with your DailyEndorphin account. Set up your next challenge as an exclusive Fitbit-only challenge or keep it inclusive by allowing all users within your organization to participate via manual logging or Fitbit. 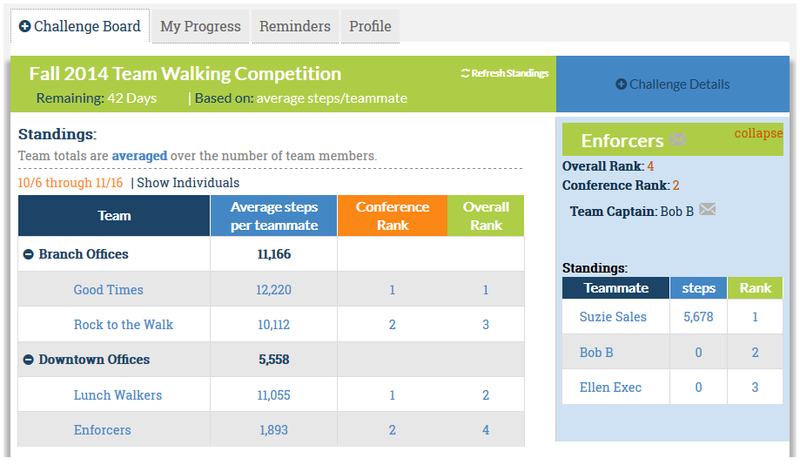 Simply wear your device, periodically open your Fitbit app and within 10 minutes your steps data will automatically upload into your DE user dashboard and challenge leaderboard standings page (see screen shot below). No more manual self-reported entries required! And remember, anyone at your company, within your department or social circles can take the initiative to quickly set up an affordable, flexible “DIY” DE challenge and invite others to join in just a few minutes. DailyEndorphin enables anyone in groups of any size and type to easily set up friendly, configurable, highly affordable “DIY” wellness challenges and programs based on recommended physical activity and healthy objectives. DailyEndorphin provides an interactive way to motivate and engage its users in healthy behaviors leveraging group dynamics, competitions, and goal-setting. DailyEndorphin enables organizers to easily set up manage and promote customizable fitness, weight loss, nutrition, and wellness challenge events and offers back-end reporting and administrative control. DailyEndorphin’s mission is to enable people to live a healthier, happier life in the context of supportive social networks. DailyEndorphin works with groups of all sizes, including employers, health plans, wellness consultants, employee benefits brokers, health clinics, government entities, friends, families, and communities. Questions or feedback about our program? Please contact us any time at support@dailyendorphin.com with either item. We would love to hear from you!